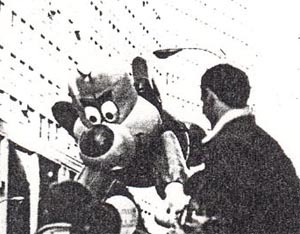 Only a year after Underdog originated, Macy's in New York chose to perpetuate him via a medium other than T. V. cartoons: a helium balloon, which was first augmented at the 1965 Thanksgiving Day Parade and then every subsequent parade up to 1984. It must be remembered that the Underdog cartoon series ceased broadcasting on the large networks (NBC & CBS) well in the early 70's, and from that point on became solely dependent on its own syndication, which was often rather sporadic and territorial. Many provinces who had not viewed the program in years would be suddenly confronted by a ghost from the past, and thus would be forced to reeducate themselves with both the character and his history. 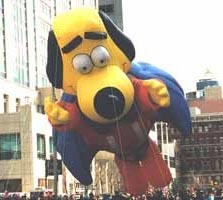 In all that time there was no apparent evidence of human before donning bulky suits and masks so that Underdog could come to life at functions other than the Thanksgiving Day Parade, and in more convenient sizes other than gargantuan. As a young Underdog fan, I certainly never saw such interpretations. Neither did the situation change after 1980, when I first portrayed Underdog at a science-fiction masquerade. In 1986, I made my very first appearance on the public access cable T. V. variety show, Beyond Vaudeville, a good two years after the balloon had already been discontinued. 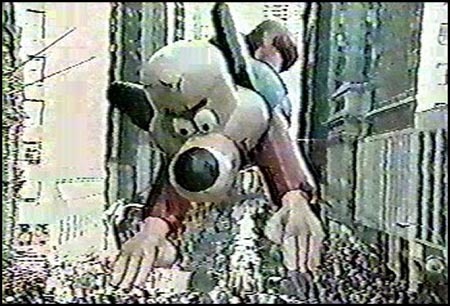 In addition, in 1989, in conjunction with Underdog's 25th Anniversary, I expanded into block parties, carnivals, T. V. interviews and parades; but a continued absence of interpretations persisted. Now, however, and old method may now prove to be a serious threat to all of my efforts. In 1992 I made an attempt to join the Thanksgiving Day Parade in Philadelphia, but I was refused this on the grounds that I was not licensed. In 1993 I made yet another attempt; but it yielded the same results. I even wrote to Filmtel, Inc. (The copyright owners) so that Imight receive such a license, but my appeal went; and remains, unanswered. I did not watch any of the parade telecasts, but the very next evening I received the shock of my life: waiting in line to register for yet another parade, a man approached me and informed me that the Thanksgiving Day Parade in Philadelphia actually utilized an Underdog balloon!! Whether or not the balloon itself was in fact the original balloon or a newly-constructed one was not clarified, but needless to say, I was utterly, flabbergasted! 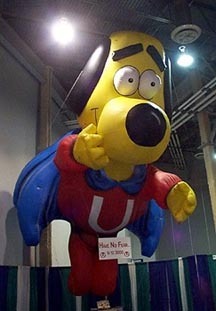 Philadelphia had said no to MY interpretation of Underdog and then utilized the balloon anyway! Neither was this the only sighting, mind you. In 1991 I had performed Underdog for a Christmas parade In Harrisburg PA. I had not returned since that time due to the fact that a couple of other locales closer to MY home had held their parades on the very same day, and I surrendered Harrisburg for them. This time around, however, these particular sights had either discontinued their parades or were merely not accepting any individual entries, so it was thus my opportunity to go back to Harrisburg. However, although I had contacted the organization well ahead of time, they failed to send me a registration form. I waited all through September and October with no results until, finally, at the very start of November, I contacted the Harrisburg people and promptly demanded to know exactly what was going on. After much deliberation, I was asked, believe it or not, for the very first time in my life, what my act was. After I provided them with the requested information, they informed me that they were using an Underdog balloon! They promptly then asked of me, "Why should we use you when we already have an Underdog balloon?' What an insult!! Thus Harrisburg was now added to the list of sites which utilized Underdog, but at the same time sacrificed me in the process! And they kept me in suspense for this? Needless to say, I was furious. 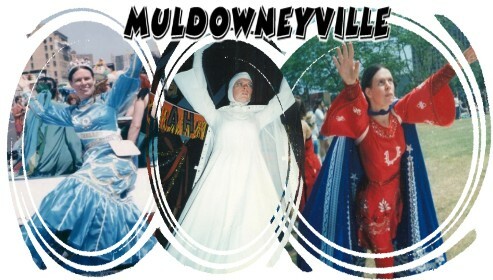 I hammered home to the Harrisburg people and wrote them an angry letter stating that, in many of the parades that I had attended, I would often see several entries containing a group of characters, with many of the characters being unwittingly duplicated, more often than not. In submitting their information, these entries knew neither one another nor their plans, but more to the point: the organization in charge did not force these entries to eliminate their recurring characters. Characters who were, more often than not (especially at that time), the current trendy-types, and thus well apt to be seen numerous times in the course of the same parade. 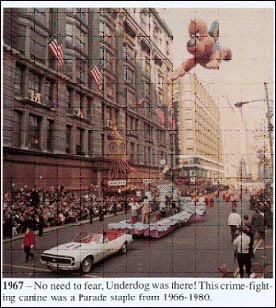 The Macy's Underdog Balloon was a central focus of an episode of NBC's "Friends"
Approximately one year after 1984 (I cannot recall the exact year), Macy's Thanksgiving Day Parade utilized Snoopy as either a costumed individual or a stuffed figurine; and they also had a helium balloon! Two Snoopys in two different media! I also happen to remember an emcee saying "Now that Snoopy has graduated to balloon status... ". That infuriated me! The mere implication that a character was either accomplished or worthy enough or both but on TV if they were in giant balloon form?!? In addition, since the balloons were always so irrationally large, spectators would always be easily impressed by these oversized monstrosities and would remember them much longer than they would remember any entry with a person inside of it! Because the balloons always had tether lines, they often had to deal with overhead utility wires; because of this, only the streets of major cities had spaces large and wide enough to accommodate them. As a result, the balloons could only appear in large cities, especially since metropolitan locales, unlike suburban ones, are always made the center of attention by both the media and the events that are made regionally or nationally important. Performers would have to have urban events to their credits, as opposed to small-time suburban ones, dare they be considered inferior!